Matsumoto Castle 「松本城」 is one of the few remaining original castles left in Japan (most of the other castles in the country have been rebuilt due to various reasons). It is also known as the “Crow Castle” because of its black exterior. 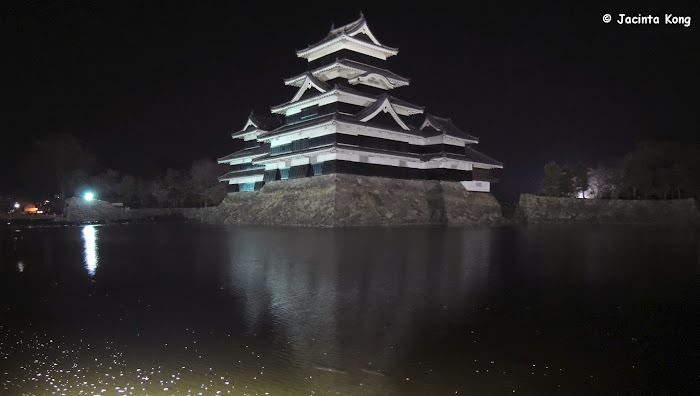 Constructed in the 1500s, Matsumoto Castle has the oldest castle donjon remaining in Japan and is one of four castles designated as “National Treasures of Japan”. There are about 300 sakura trees (cherry blossom trees) planted around the castle moat and on the inner grounds of the castle. Amazing views of the Japanese Alps, Matsumoto City and the koi and swans circling in the moat can be seen from the castle windows. Unfortunately my tour bus only arrived at Matsumoto in the late evening, which meant the castle was closed by the time I got there, so I just had a wander around the park surrounding the castle. Noticed some sakura petals floating in the moat so I wondered if the cherry blossoms were still in bloom. To my delight, I found this Shidarezakura tree (weeping cherry tree), which was one of several found outside the castle. Although the pathways around the castle were lit, the lighting was still quite dim, so I had to use my camera flash to be able to see the sakura more clearly. Strolling further around the castle grounds, I noticed something under the trees near the moat and found that a swan had made her nest there! My hubby initially thought it was a statue as she sat there for some time without moving! I headed over to the castle again the next morning after checking out from my hotel (10min before my tour bus departure time), so I didn’t have time to walk around to the other side of the castle to capture the day view of the sakura trees. Too bad we had to depart before the castle opening hours, which means that I’ll need to make another trip back here to explore the interior of the castle. This is the shot which I took in the morning. You can see the castle walls look black in daylight. Panoramic view of the castle and surrounds. Address: 4-1, Marunouchi, Matsumoto City, Nagano Prefecture, Japan. Every spring during the cherry blossom season (April), visitors can enjoy “Nighttime Cherry Blossom Viewing” and be treated to the sight of illuminated cherry trees. Admission into the interior garden of the castle is free for this event. The event this year had hot miso soup with pork (tonjiru) and sweet rice dumplings available for purchase. There was also Japanese tea and seating available for 500 yen, so that visitors could sit and enjoy the night flower viewing experience whilst sipping tea. Performances of the Japanese koto, the flute, and classical gagaku music were also held each night.